I was recently asked to design a bridal shower invite for a bride that is also a graphic designer...yikes! 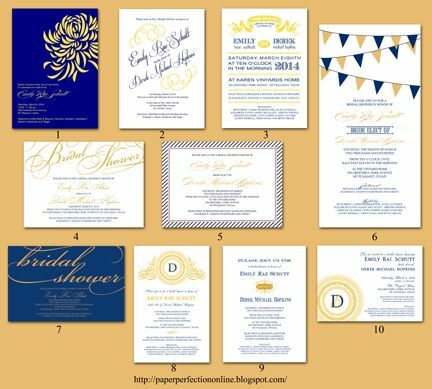 I was told that she that her signature colors are yellow and navy, she had a super fun personality and wanted something different from the normal bridal shower invitation. Here are a few of the sample invitations that I created. If you would like one of these for your next event or need a custom invitation, contact Paper Perfection at jtanddolly@yahoo.com for pricing and details.